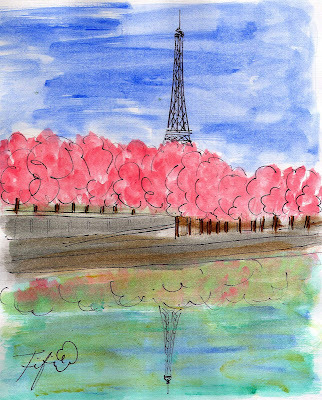 This lovely painting is AVAILABLE in Fifi's Shop... and of course... mais oui... it can be made into a print or 5"x7" frameable card... just ask!!! SPECIAL SALE TODAY ONLY... SALE ENDS 5/23/12 at 10PM California time... 60% off EVERYTHING in Fifi Flowers'Shop... DON'T MISS OUT!!!! Must use CODE: CELEBRATE60 ENJOY! P.S. See other Outdoor Wednesday postings HERE! I would definitely like to be strolling along the Seine right now - love the reflection in the water. I have never been to Paris but this painting Fifi makes me dream for just a moment that I am there.